2500 people sold out Jill Cataldo's Super-Couponing workshop in Charleston! It was the largest coupon event ever held in the United States! 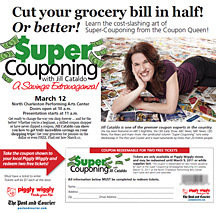 Jill Cataldo's Super-Couponing coupon class is the easiest way to learn couponing! 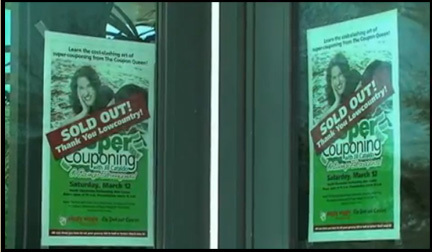 2500 people flock to Jill Cataldo's Super-Couponing Workshop in Charleston, South Carolina... the largest coupon event ever held in the United States! 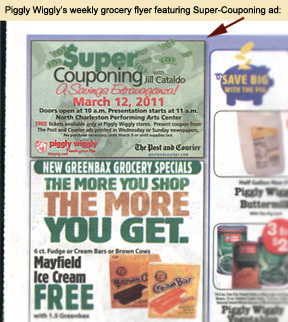 Jill Cataldo's column, "Super-Couponing Tips," is read by over 20 million people each week, appearing in newspapers around the country. Charleston's oldest newspaper, The Post And Courier, approached Jill about hosting a large, live Super-Couponing event for its readers, thousands of whom enjoy her column each week on Wednesdays in the paper. Aiming to host "the largest Coupon Extravaganza in the country," The Post and Courier teamed up with Piggly Wiggly Supermarkets to sponsor the workshop, which was held at the North Charleston Performing Arts Center. Jill worked both with the Post and Courier and with Piggly Wiggly to customize her presentation to feature information about the newspaper, as well as the supermarket chain. Several months prior to the class, Jill traveled to South Carolina and spent a few days shopping at Piggly Wiggly and becoming familiar with the chain's policies and promotions. In preparation for the Charleston Super-Couponing workshop, Jill then worked directly with Piggly Wiggly to incorporate information about the store's loyalty program, sales and coupon policies into her presentation. Both the Post and Courier and Piggly Wiggly did an incredible job of promoting the event, with co-branded promotion in newspaper print ads, advertisements in Piggly Wiggly's weekly grocery circulars, and television commercials. This video is presented with Macromedia Flash. Tickets to the workshop were free. To receive a pair of tickets to the event, readers of The Post and Courier had to take one of the newspaper's print advertisements for the workshop to any local Piggly Wiggly supermarket. When the cashier scanned the barcode in the ad, the workshop tickets printed directly from the Catalina coupon printer at the register. With such heavy promotion running for the event, the 2500-seat auditorium sold out within nine days. All 2500 tickets were distributed at Piggly Wiggly supermarkets far sooner than anticipated --which posed an interesting problem... the television commercial for the event had to be pulled off the air! The commercial was scheduled to run for an additional two weeks, but all of the tickets were distributed so quickly that there was no need to continue telling shoppers to obtain free tickets at Piggly Wiggly stores. On the day of the event, the Post And Courier ran a sticky-note ad campaign on the front of the newspaper reminding readers to attend and thanking them for the response to the event. The Post and Courier and Piggly Wiggly were offering free coupon wallets to the first 500 people in the door. While Jill's Super-Couponing workshop was not scheduled to begin until 11:00am, attendees began lining up prior to 8:00am! During the hours before the event, The Post and Courier and Piggly Wiggly hosted an expo in the outer area of the Performing Arts Center, with booths offering on-the-spot newspaper subscription signups and Piggly Wiggly loyalty card registrations. Food manufacturers, including Smucker's and Snyder of Hanover, were on hand offering free product samples and coupons to a very savings-enthusiastic audience. Local business, department stores and vendors sponsored giveaways and prize packages as well. On March 12th, 2011 at 11:00am, Jill took the stage to an enormous crowd and presented her Super-Couponing workshop, customized for the Charleston audience. While her standard workshop features sale examples from retailers around the country, for this workshop, Jill added numerous slides, sales, and examples featuring Piggly Wiggly's loyalty rewards promotion, "Greenbax," which function like cash for shoppers' future trips to the store. She also taught specific coupon usage strategies in compliance with Piggly Wiggly's coupon policy. Everyone in the audience went home with a copy of The Post and Courier's "My Charleston" magazine, which contained a coupon worth 5 Greenbax at Piggly Wiggly. The attendees were thrilled, not only that the entire event was free but that, via the Greenbax, they also "made" $5 to attend. The event exceeded all expectations! While her weekly audiences number in the 300-400 attendee range, Jill also enjoys holding large-scale Super-Couponing workshops like this one. Two weeks after this event, a pair of Super-Couponing workshops co-sponsored by Indiana's The Times newspaper and the Northern Indiana Home and Garden Show drew over 2,000 people each day. But the Charleston Super-Couponing "Extravaganza" currently holds the record both for the largest Super-Couponing workshop attendance and the largest coupon-related event in the country! with Jill Cataldo's live workshops! Get yours today on DVD and start saving!